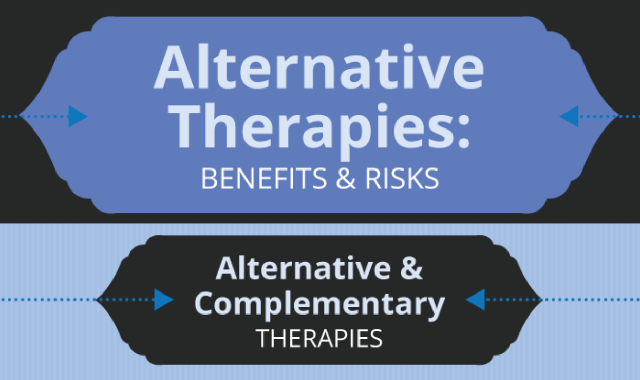 Alternative Therapies: Benefits and Risks #infographic ~ Visualistan '+g+"
In a world where the use of many prescription drugs and medical procedures are at an all-time high, people are seeking alternatives to conventional medicine. Alternative therapies refer to treatments that have not been scientifically tested for effectiveness, or whose effectiveness has not been shown despite scientific testing. In the United States, many alternative therapies are used as complementary medicine. That is, rather than taking the place of traditional medicine, they are used to complement those approaches, sometimes thought to boost efficacy and reduce side effects of traditional medicine and approaches.